It's super cool! 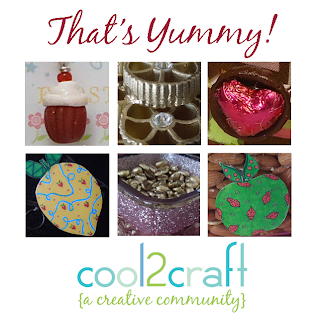 Cool2Craft TV February 27, 2012: That's Yummy - We're heading to the kitchen for this week's creative inspiration! EcoHeidi Borchers is making fruit themed stickers with Aleene's Tacky Sticker Sheets and Aleene's Magnetic Tacky Dots, Tiffany Windsor is creating a Pasta Art Box with Aleene's Fast Grab Tacky Glue, Savannah Starr adds a splash of glitter to a Make-Up Brush Holder featuring Aleene's Fabric Fusion Peel & Stick Tape and Candace crafts a yummy look of chocolate Candy Ring. It's a terrifically tacky and creatively cool show! It’s easy to watch the Cool2Craft TV Channel right from your computer. Airing Monday February 27, 2012 9am Pacific/10am Mountain/ 11 am Central/ Noon Eastern. Go to http://cool2craft.com and find the Livestream player and chat box. See you Monday! Visit us on Facebook! Craft on!